Now that the weather has warmed up and we can enjoy going outside more often, I love seeing all the beautiful flowers around the area. I have flowering pots in a few areas around the house, bushes which bloom at different times of the year and some annuals in the landscaping. But, we all know, that keeping a beautiful yard beautiful, takes a lot of work. Most of us don’t have the time. But, there are ways to have all that colorful beauty in the yard by having plants that don’t need much water or care. 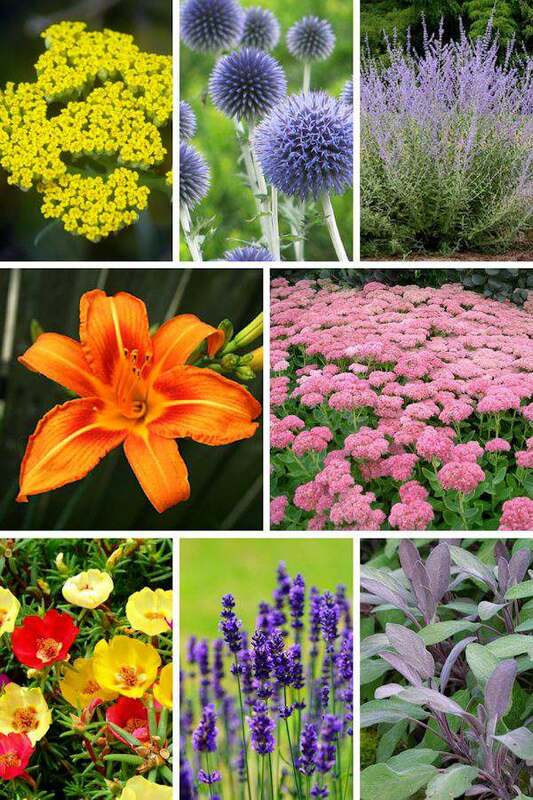 Depending on your planting zone and with a little research, there are really a lot of blooming plants out there that are low maintenance and don’t need much water after they are established. I want to save as much water as I can and wasting it isn’t an option. I will look for plants that don’t require much water and I use rain barrels and misters in the garden and landscaping to help conserve water and save me on our water bill. Below is a list of some of my favorite water-wise plants you can grow. All these are low maintenance and don’t need much water at all. Many are very hardy and will come back year after year, depending on your planting zone. Most of these are also big pollinators for butterflies and bees. A couple of these varieties below I have tried in my yard, but when the summertime heavy rains come around they didn’t survive. Something to consider if you live where it gets a bit tropical with humidity and rain. All the flowers below, I have in my yard or my neighbors have them. 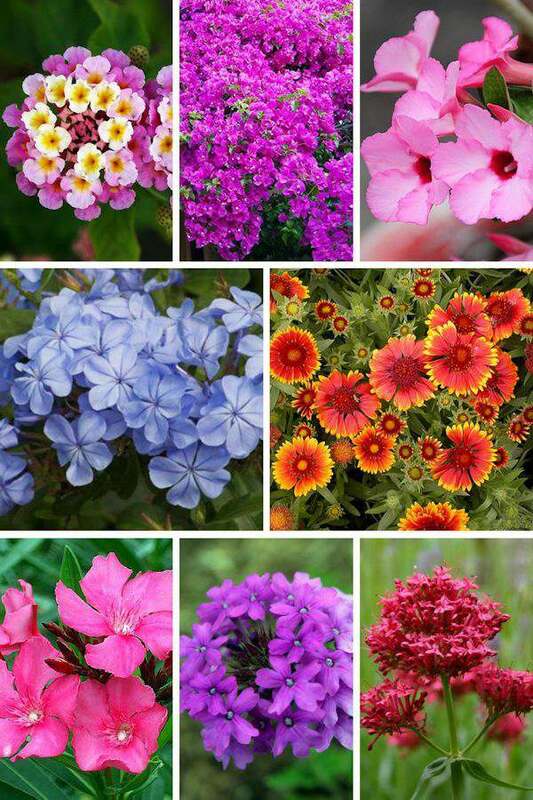 These are colorful and blooming flowers you will see throughout the summer season until the first frost. Here in Zone 9 if we have a good frost, the plant will burn down to the ground. But, in the spring just cut off all the dead areas above the ground and wait for the new plants to come up on their own. Lantana – There are so many different colors of lantana to choose from. You can trim and trim and the plant never cares. Really, really hardy and a constant bloomer. One suggestion from experience, don’t leave this plant in a pot for too many years. Its root system is huge! Bougainvillea – This plant is at its showiest when it doesn’t have a lot of water or fertilizer. It grows well in the ground or in pots and a great choice if you live near the ocean. It only smiles at salty air. Adenium – The common name for this plant is Desert Rose. A neighbor gave me two of these plants and his suggestion was….Don’t water it. Just give it a bit of fertilizer a couple of times a year and watch it bloom. He was right! These really look nice in pots. Plumbago – One of my favorite bushes in the yard. It blooms true blue flowers from spring until a frost. Butterflies love the flowers and I can trim this one down to the ground and it only comes up better than before. I let nature water this bush. Blanket Flower – I started my bunch from seeds and there is a reason why its called Blanket Flower. Before you know it, your ground is covered with these beautiful orange flowers. My bunch has been hit by frost several times but still keeps blooming. Its one of the few plants I have that blooms almost all year long. Butterflies and bees swarm this plant. Oleander – This sun-loving plant can be seen all up and down highways here in Florida and in the deep south because its so hardy. Flowers most of the year and comes in several colors. This is one plant I finally had to take out of my yard though because it became so large. Plant this where you have plenty of room for it to grow and forget it. One bad side of this plant, it is poisonous to humans and pets if swallowed. When trimming the plant, wear gloves to keep the white milky sap from getting on your skin. It can be irritating. Verbena – Easy plant to grow from seed and grows from Zones 3 – 10 and is considered deer and rabbit resistant. Great for ground cover, pots or hanging baskets. Frost will burn this to the ground and if you live further south, it will come back the next year. Colors galore and loves the heat. Red Valerian – Also known as Jupiter’s Beard, if you love the color red, this is a must plant for you. Its tough, durable and thrives with little water and the butterfly’s love it. This is really good to know. Sometimes I over water plants that really don’t need that much, and now I’ll be more aware of that. This is a great post, I am awful at remembering to water plants so I think I need to think about putting some of these into my garden. I’ve seen plants die because of too much water. I think people have this impression that because they need water to survive, they should get plenty of it. 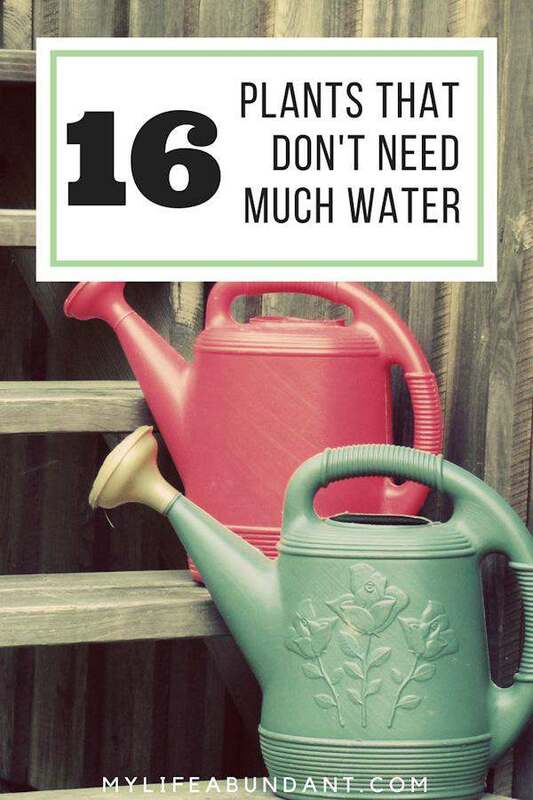 We definitely have to make sure how much water our plants need. This is definitely a timely article for us. We are heading to the nursery today to find some plants. I can’t thank you enough for this! I have such a black thumb and I forget to water my plants all the time. This will be a lifesaver – for them! Great post! I’m horrible at remembering to water plants. This is helpful! Wow, this is so nice. Now I have an idea already on what plants to choose. Hopefully I can have them for long when I planted some of those plants. I’m so glad you wrote this post because the past few weeks I have been wanting to research plants that don’t need much water. My husband and I have a small garden area in front of our home, but the way the sunlight comes in, it is not good for plants. We have tried to maintain a flower garden, but the flowers always die because they need constant watering. Your list will help me now find plants that we can actually grow! I love watering plants! And I didn’t know, that there’s plants that don’t need to much water. I am glad to know about this ? This is great to know. I always forget to water my plants. These are really great to know! I always find myself worrying about whether or not my plants have enough water to strive. Orange Day Lilies and Lavender are my favorite! Thanks for the tips! A very helpful list for areas with low rainfall. Pinned and shared. I need these because 1 we live in the desert. Then number 2, all my plants die from a lack of water.